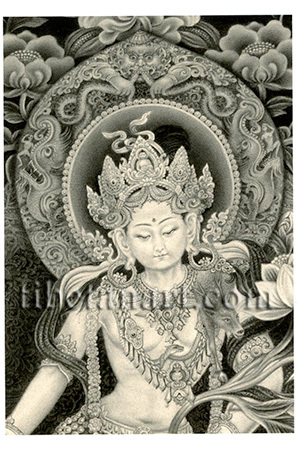 This detail from an exquisite black and white painting by the great Newar artist, Siddhimuni Shakya, depicts the face of Padmapani Lokeshvara, the 'Lotus-holding Lord of the World'. Lokeshvara, or Avalokiteshvara, is the bodhisattva of great compassion, who has a hundred and eight different manifestations in the Newar Buddhist tradition. His beautiful face radiates serenity, and his ornately jewelled crown bears the central image of Amitabha Buddha, the 'Lord of the Lotus Family', of which Padmapani is the principal bodhisattva. An antelope-skin is draped over his left shoulder, a serpent serves as his sacred thread, and he wears a golden choker, a chained silver medallion, and an ornamental garland of flowers around his neck. His ornate halo is adorned with two crocodiles or makaras with small figures in their jaws, and the crowning serpent-devouring head of kirtimukha.